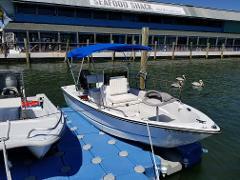 17' Center Console is a great little boat to get around the bay and inland waterways for fun, fishing or sandbar hopping. 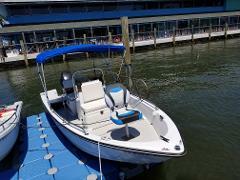 It has a shade bimini, radio, rod holders and anchor. 14' Livingston Cat skiff is your basic little runabout. Boat has a motor and anchor. You will get a navigational chart for your boating area. This is a great boat for 2-3 adults looking to get out for an affordable day on the water.